A glacier model is a simple way of describing a glacier or ice sheet, using well-understood mathematical relationships, such as the deformation rate, amount of melting, snowfall and precipitation. There are quite a few interactive glacier models on the internet that you can play with. Use these models to experiment with making glaciers and ice sheets shrink and grow by changing temperature, precipitation, slope and other variables. These glacier models might be fun for someone studying for a Geography A-Level or a Year 1 or 2 undergraduate to play with. 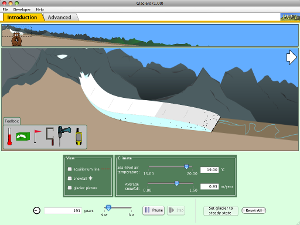 PHeT from the University of Colorado at Boulder has an excellent interactive glacier simulation that you can use to change precipitation and temperature to grow or shrink a glacier. Use the tools in the bottom left hand corner to measure glacier thickness, velocity, distance from headwall, and things like accumulation and snowmelt. You can also click to see the real glacier that the model is based on. Download the file and save it to your desktop, or run the model in your browser. This model has a simple interface for new learners and a more advanced interface for more experienced learners. Can you identify the snowline and equilibrium line altitude on the glacier? Using the advanced option, what can you tell about debris that is caught in the ice? What does this tell you about the formation of moraines? Can you see crevasses in the glacier ice? Note how the glacier ice keeps moving forward, even when the glacier is receding. This page has some suggestions for projects for A-Level and Undergraduate Geography students, using this model. This very simple glacier model from the University of Kentucky allows you to change snowfall and temperature to make a cirque glacier grow and shrink. This model shows a plan-view map of a simple mountain glacier, and it’s good for exploring concepts such as glacier flow, accumulation and ablation. What combinations of snowfall and temperature make the glacier biggest? What happens if temperature is high but snowfall is also high? This model is very easy to understand, and great for younger learners. GNS has an interactive glacier model and you can change slope, snow, temperature, and various other parameters to make the glacier flow and get bigger or smaller. Download the icon to your desktop and run it. Move the sliding bars up and down to watch the glacier grow and shrink. This is a 1D flowline model simulation. JISM is based on Frank Pattyn’s GRANTISM model, and was made by Martin O’Leary from Swansea University. See the GRANTISM website for more information. This Virtual Glacier from Portland State University allows you to experiment with changing a number of variables to make a glacier advance and retreat. Click on the Small or Large viewing size to bring up the model, and work through the different Modules to change different aspects of the glacier. Under each Module, you’ll need to click on ‘Model’ on the left hand sidebar to bring up the glacier model. This is a simple 1D flowline model. Thanks for this comment and the link! That’s a huge, comprehensive and very useful database of glacier lengths. Sounds like an interesting idea for a student practical.